events Archives - GetGoing NC! Holiday Hiker is both a series of hikes we’re doing in December and an overriding philosophy here at GetHiking! Celebrate the Dark of Day! Gates open at 5 a.m.! Food trucks! Vendors! Live streaming! Don’t you dare miss it … ! In fact, it’s the poster promoting Total Solar Eclipse 2017 at Gorges State Park, part of the normally staid North Carolina State Park system. North Carolina, and the mountains in particular, are burning up with eclipse fever. For you, that translates to lots of events where you can share the experience with others, maybe hear some live music, sample the fare from a food truck or two, score a pair of those hard-to-get eclipse-watching glasses. =&1=&, 1 minute and 47 seconds of total darkness. Eclipse central will be Bridge Park, where, from 11 a.m. to 3 p.m., you’ll find food trucks, educational tents, kids activities and a planetary walk. More info here. =&2=&=&3=&(pronounced “Cashers,” fyi), 2 minutes and 23 seconds. Food trucks, live music and fun, sure, but there will also be solar eclipse experts with special viewing equipment. Go to the local post office and get your special solar eclipse thermal stamp canceled. Festivities run from noon to 4 p.m. More info here. =&4=&, anywhere from 20 seconds (Looking Glass Overlook, Milepost 417) to 44 seconds (Waterrock Knob, Milepost 469). Parkway officials will be allowing roadside parking (provided you are entirely off the road) for this stretch of the southern parkway west of the Pisgah Inn; still, expect a zoo as moonstruck motorists vie for prime viewing spots. Check out RomanticAsheville.com‘s Blue Ridge Parkway Guide for overlooks and other stops along this section. =&5=&, Sapphire, about 2 1/2 minutes. Yes, the gates really do open at 5 a.m. (the park typically opens at 8 a.m.), meaning you might want to camp outside the gate to score the best viewing spots and to enjoy the pre-eclipse entertainment, including music by Tina Eno, the Blue Ridge Bakery Boys, Quarter House Band, and the Singing Vegetables puppets. More info here. =&6=&Burnsville, 98.43 percent totality. View near totality from the highest point on the East Coast. Featured event: How an Eclipse Happens. Events from 11 a.m. to 3 p.m., in the Upper Summit Parking Lot. More info here. =&8=&, Raleigh, 93 percent. Warning: Did you know it can be harmful to view the eclipse without special eclipse glasses? Be among the first 100 to register for the eclipse event at Umstead State Park and the Friends of State Parks will make sure your eyeballs are eclipse-proof. Also on hand: a Dobsonian Telescope with solar filter to view the sun before the total eclipse. Noon to 4 p.m. More info and pre-register here. =&11=&, 93 percent “Obscuration,” Greensboro. This event focuses on the peak of the event, from 2-3 p.m., with park staff assisting viewers in the open field near the parking area. 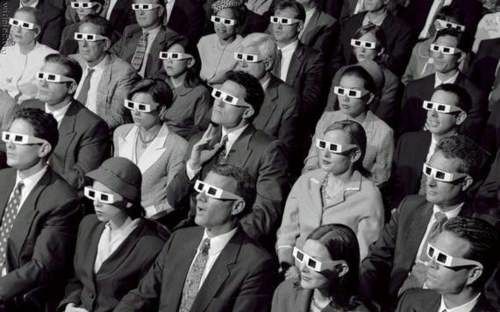 Free safe viewing glasses provided to the first 70 participants. More info here. =&12=&=&10=&Lillington, 94 percent. Come to the Visitor Center at 1 p.m. where eclipse educational stations will be set up; then, take your camp chair out front to the grassy field and watch. More info here. =&15=&, Bahama, 93 percent. Our GetHiking! group hosts an event for those late to the eclipse party. Bring a lawn chair. More info and sign up here. A volunteer hauls in posts to build a bridge on the Mountains-to-Sea Trail. We love trails. You love trails. Saturday, we show that love during the annual National Trails Day observation. Launched by the American Hiking Society in the early 1990s, NTD is the one day of the year where express our love of hiking trails, paddle trails, singletrack mountain bike trail, doublewide equestrian trail … if it’s a trail, it’s covered under the NTD rainbow. 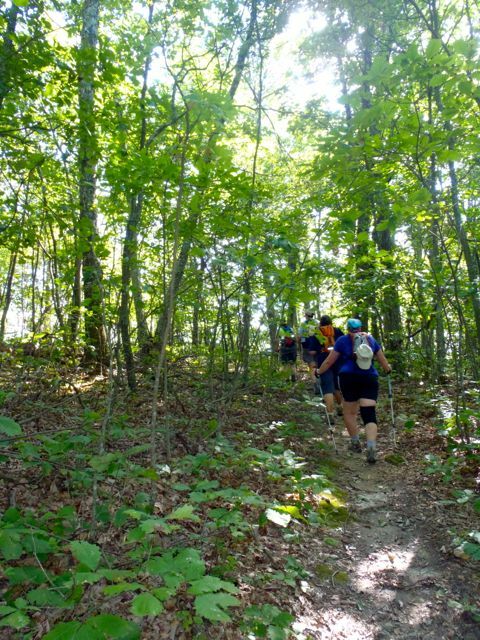 Dozens of National Trails Day events are planned in North Carolina for Saturday. We’ve compiled a list of 37 events; we provide the basics and a link or phone number where you can score specifics. We’ll rerun a more complete list a week from today, on Thursday, June 5. In the meantime, leave Saturday, June 7 open. You have a date with a trail. Asheville: Mountains-to-Sea Trail Workday, Soco Gap area on the Blue Ridge Parkway, Carolina Mountain Club. 8:30 a.m. (carpool from Asheville). More info at 828.230.1861 or lesrlove@gmail.com. Boone: Hike, Boone United Methodist Church, 11 a.m.- 2 p.m. Details. 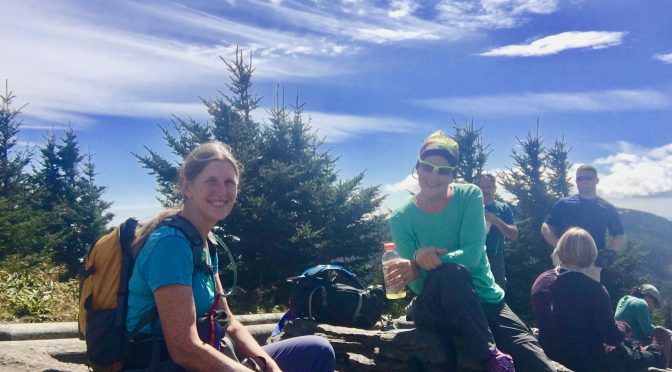 Boone: The Summit: A Dynamic Hiking and Backpacking Conference for Women, Trail Dames, 3 p.m.-midnight. Details. Burnesville: Hike, Mount Mitchell State Park. 1 p.m. 828.675.4611. Details. Chimney Rock: Guided hikes, Chimney Rock State Park, 8:30 a.m. – 5:30 p.m. Details. Deep Gap: KAMPN Kleenup & Kookout, Camp Cogger, 10 a.m.-3 p.m. Details. 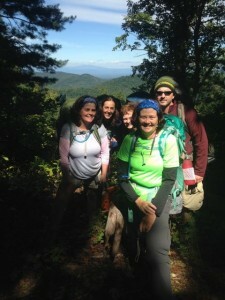 Franklin: Wilderness hike, southern Nantahala Wilderness Area, Nantahala Hiking Club 9 a.m.-3 p.m. Details. Gerton: Workday on Bearwallow Mountain, Carolina Mountain Land Conservancy, noon-3 p.m. Details. Great Smoky Mountains National Park: Appalachian Trail Workday, Friends of the Smokies, 7:30 a.m. to 5 p.m. More info: 865.932.4794, 800.845.5665 or hollys@Friendsofthesmokies.org. Laurel Springs: Workday, New River State Park. 1 p.m. 336.982.2587. Details. West Jefferson: Wildflower hike, Mount Jefferson State Natural Area, 2-3:45 p.m. Details. Spruce Pine: Overmountain Victory Trail/Hefner Gap “Freedom Hike”, Overmountain Victory Trail Association, 10 a.m.-2 p.m. Details. Todd: Workday, Elk Knob State Park, 9 a.m. – 3 p.m. Details. 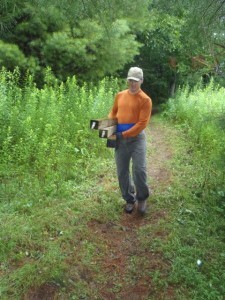 Cary: Workday, Hemlock Bluffs Natural Area, Town of Cary, 9:30 a.m.-noon. Details. Chapel Hill: Morgan Creek Trail Phase 2 Grand Opening, Chapel Hill Parks & Recreation, 10 a.m.-noon. Details. Durham: Hike to Fish: Beginning Fishing with a Park Ranger, Eno River State Park, 10-11:30 a.m. Details. Durham: Workday, Eno River State Park, 9 a.m.-2 p.m. Details. Morrisville: Triangle Fat Tire Festival, Lake Crabtree County Park. Saturday and Sunday. More info here. Raleigh: Volksmarch Habitat Hike, Umstead State Park. 9 a.m. 919.571.4170. Details. Raleigh: Prairie Ridge Ecostation to William B. Umstead State Park Volksmarch Habitat Hike:, NC Museum of Natural Sciences, noon to 1 p.m. Details. 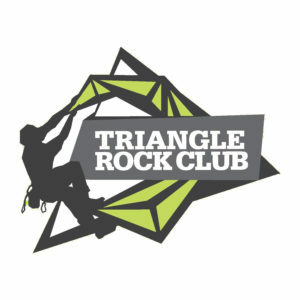 Triangle area: Falls Lake / Mountains-to-Sea Trail workday, 9 a.m.-4 p.m. Details. Wake Forest: Volunteer Appreciation Day, Wake Forest Greenways Advisory Board, 9 a.m.-3 p.m., Details. Browns Summit: Hike, Haw River State Park. 10 a.m. 336.342.6163. Details. Burlington: Shallow Ford Natural Area Track Trail Grand Opening, Alamance County Recreation and Parks Department, 4-5:15 p.m. Details. Danbury: Workday, Hanging Rock State Park. Call for time. 336.593.8480. Details. Greensboro: National Trails Day Festival, Country Park, City of Greensboro, 7 a.m. to 1 p.m. Details. 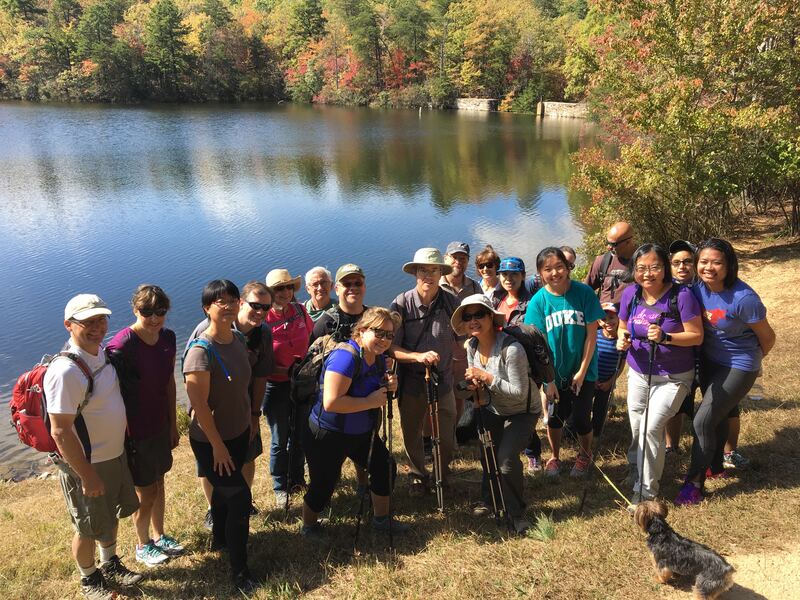 Haw River: Guided hike, Haw River State Park, 10-11:30 a.m. Details. Pinnacle: New trail dedication and hike, Pilot Mountain State Park. 9 a.m. 336.325.2355. Details. Gastonia: Workday, Crowders Mountain State Park, 8-11:30 a.m. Details. Lake Norman: Workday, Lake Norman State Park, 9 a.m.-noon, Details. Matthews: Hit the Ground Running Trail Race, Colonel Beatty Park, Go Run Events, llc, 7:30 a.m. Details. 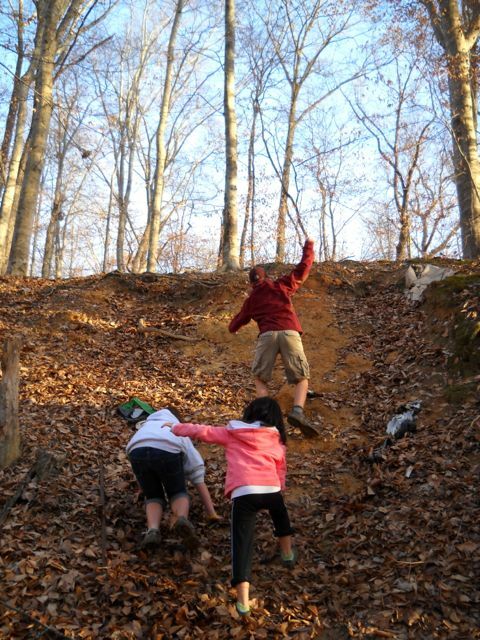 Newton: Trail construction/volunteer workday, Carolina Thread Trail, 9 a.m.-noon. Details. Connelly Springs: Hike, Bike & Ride, South Mountains State Park, 10 a.m.-5 p.m.
Before kids come out to a program at the Prairie Ridge Ecostation, the N.C. Museum of Natural Sciences’ wildlife learning center, Jan Weems asks them to draw a picture of what they think they’ll see. “They draw pictures of bears and lions and all these really big animals,” says Weems, the center’s senior manager of early childhood programs. At the end of the program, when she asks them to draw a picture of what they actually did see at this 45-acre natural oasis in the heart of Raleigh, she gets sketches of tadpoles, frogs, crickets, ladybugs … . “The reality is it’s really much more fun to get close to a lady bug,” says Weems, who has been in the business of exposing kids to the outdoors for 30 years. The reality is also that today more than ever, too many kids like the ones viewing Prairie Ridge as a wild jungle have only a vague notion of what’s going on outside their living room windows. Take a Child Outside Week was spurred by Richard Louv’s 2005 bestseller, “Last Child in the Woods: Saving Our Children from Nature-Deficit Disorder,” an account of how, in less than a generation, our kids have gone from being weaned in the wild to garrisoned in the great room. To anyone who came of age pre-1980, the notion of having to be reminded to go outside and play would have seemed crazy; outside — in a local forest, along a nearby creek, in a neighborhood park — was where kids went to escape. But as Louv notes, a proliferation of electronic options and increasingly protective parents have conspired to keep our kids inside. According to at least three studies conducted between 2001 and 2005, children spent half as much time outdoors as they did 20 years earlier. A 2012 study by the Outdoor Foundation found that the trend has continued, with youth participation since 2006 dropping across the board, with the greatest decline among 6- to 12-year-old girls. A Kaiser Foundation Family study found that kids 8 to 18 years old devote an average of 7 hours and 38 minutes to “entertainment media” in a typical day. In a typical week, according to a 2008 Children & Nature Network report, only 6 percent of children ages 9-13 play outside on their own. At least two studies, in 2005 and in 2007, found that children who play outside are more physically active, more creative in their play, less aggressive and show better concentration. Kids exposed to the outdoors via “wild nature activities” before the age of 11 grow to be adults more concerned about the environment. Weems and Prairie Ridge hope to narrow that gap with their new Nature Playspace, which will be unveiled Saturday, Sept. 28. Many of the Take A Child Outside Week events scheduled statewide are likewise geared toward letting parent and child explored together. At Shelley Lake in Raleigh on Tuesday, for instance, there’s a “Family Sunset Walk” intended to expose the natural world after dark. “Festival in Motion” on Saturday at Raleigh’s Walnut Creek Wetland Center includes a range of kid-friendly activities geared toward exposing families to a wetlands. And Saturday’s “Talking Turkey” program lets kids explore the unfamiliar outdoor world through the more familiar world of crafts. TACO founder Baird says the opportunities to take a child outside over the next week offer an opportunity that no kid should miss out on. “We need to let kids take advantage of childhood while it lasts,” she says. “Childhood is not something to be rushed through. Looking for a scheduled outdoor program you and your kid can enjoy during Take A Child Outside Week? Great Outdoor Provision Co. has assembled the most comprehensive list of events in the state, 82 events in all, broken down by the following geographic areas: Charlotte, Greenville-Wilmington, Triad, Triangle. The events begin today and run through Monday. You can find the events here. 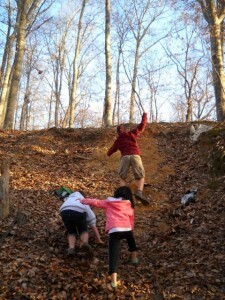 The Take A Child Outside folks offer tips on making your own outdoor adventure. Click on the link for direction.